Canary Wharf Jazz Festival brings jazz of every genre to Canada Square Park tonight and in the afternoons on Saturday and Sunday. Plus it's free! Fill a bag at a mighty east end jumble sale which starts on Saturday, 11am and closes Sunday, 6pm. Seek out theatrical or comedic entertainment on the Camden Fringe. Tickets from £5. Be at the cutting edge of art school cool music with the Yes Way festival at Peckham's Bussey Building. Go and see the Peckham wall of love in the library while you're there. Did you get a ticket for LeeFest? Try out the new driverless pods at Heathrow Terminal 5. We're reliably informed they're working! Want to go clubbing? Check out Spoonfed's clubbing picks for the weekend. 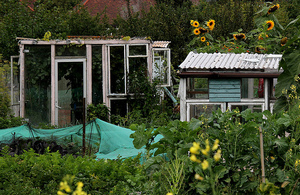 If you've got an allotment, show it off for National Allotment Week. If you want an allotment, find out more. If you local allotment waiting list is stupidly long, try planting some salad leaves on a windowsill or go to the fun day at Spa Hill Allottment Society in SE19. There's a special late night opening at the Churchill War Rooms with an American theme. From 6-10pm, tickets £15.95. Be a Renaissance man or woman at the National Gallery with a curator's tour of altarpiece, family storytelling and songs by candlelight. Free entry, open till 9pm. Watch Teen Wolf at Wilton's Music Hall and see Pete and the Pirates play after to close the London Comedy Film Festival Tranformations season. Watch world class Marathon Swimming at the Serpentine in Hyde Park from 10am. The Royal Mail Archive has an open day about culture and diversity at the Mount Pleasant Sorting Office. It's free, just drop in between 10am-5pm. Take the Overground to Crystal Palace to be a part of Crystal Palace Overground community festival. Go and hunt down the dinosaurs in Crystal Palace Park while you're there and consider the top ten things to do in the Borough of Bromley. Wear the kids out at Lea Valley White Water Centre free family activity day between 11am-5pm. Shepherds Bush Festival celebrates the W12 community on the green between 1-7pm. While you're there, check out the top ten things to do in the Borough of Hammersmith and Fulham. Walthamstow launches its E17 Art Trail in the Town Square between 11am-3pm with a flash mob shoe installation at the start line, trainer pimping and puppetry for the little ones. See off the cyclists in the London-Surrey Cycle Classic from the Mall at 9am - or wait for them to get back and be at the finish if you prefer to lie in. The Geffrye Museum, Hoxton, has an Animal Madness family day from 1-5pm, free admission. Snoop around the historic almshouses while you are there. Tours in the afternoon are just £2 for adults..
A family friendly and free to enter scavenger hunt runs at the Hand and Flower, Ham, between 4-6pm. You can also browse all latest arts and events features and salivate over our latest food and drink content for gastronomic inspiration. Thanks to everyone who gave us ideas for this post via our Facebook page. My Destination is a global travel resource powered by a diverse community of local experts on the ground, providing unrivalled local knowledge and unique local deals. We make travel experiences more enriched, more enjoyable and quite simply, better. Passionate about providing the best value for money, we work closely with the global players whilst also supporting local businesses and everyone's right to choose what suits them best. Our local experts produce comprehensive information with unique travel articles and guides, insider tips, videos and panoramic virtual tours. Through interactive features visitors can personalize, share and inspire their travel experiences. So please visit www.mydestination.com for anything ranging from hotel accommodation in London to food and drink in Ireland and much more!